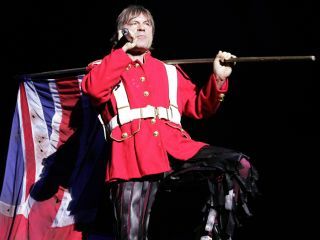 Will Iron Maiden open the 2012 London Olympic Games? Iron Maiden and the 2012 London Olympic Games. A strange combination? Not to over 92,000 Facebook fans, who have joined a rapidly growing campaign for the iconic British heavy metal group to open the UK games. Which means athletes won't just be running laps, they're be running to the hills! On the Facebook page, called 1 MILLION STRONG 4 IRON MAIDEN to open the 2012 London Olympic Games! !, a message reads: "Iron Maiden are one of the most successful bands to come out of England that are still active and are arguably the biggest metal band of all time. They deserve to play and represent their hometown of London, England in 2012! "This is a virtual petition I am going to pass along to whoever I can to get Maiden to play the London Olympics in 2012. Feel free to post pics/stories/whatever to the group. Pls repost and spread the word. LONG LIVE MAIDEN!!! Up the Irons!" During the recent Olympic Winter Games, many competing athletes were said to listen to heavy metal on their iPods before competing, so to have Maiden open the 2012 event...sounds perfect to us.